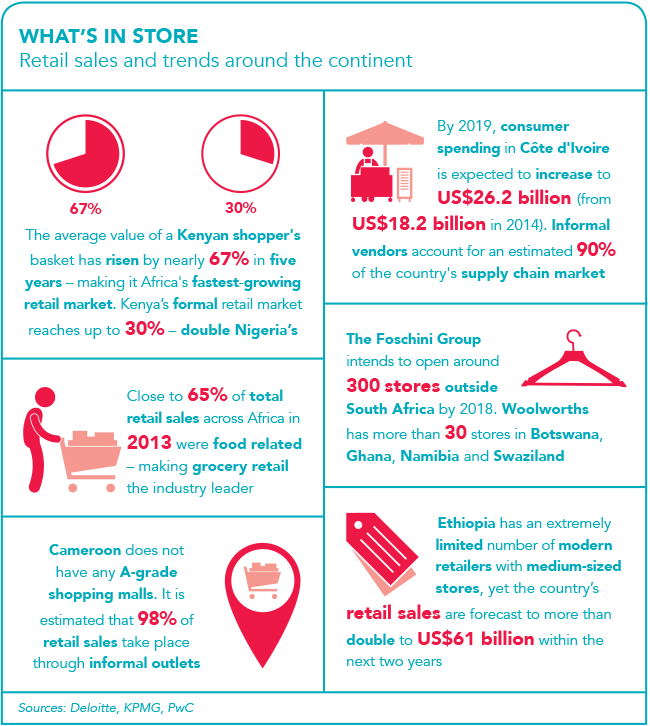 Encouraging African growth rates are proving to be a major motivator behind the expansion of retail businesses. According to Deloitte’s African Powers of Retailing report, the continent’s informal retail market is still significant, representing around 90% of transactions. It calls the African market ‘diverse, complex, interesting and characterised more by informal than formal retail’. Indeed, the successful region-wide expansion of numerous international and African retailers and consumer goods companies speaks to the plentiful potential that exists. Some of the initial retailers to venture into African markets were South African, most notably grocery chain Shoprite, which has grown into one of the continent’s leading food retailers, operating 2 653 outlets in 15 countries across Africa. During the six months to end-December 2016, the Shoprite Group’s best performer was its Supermarkets Non-RSA division, which grew turnover by 32.3% to ZAR12.88 billion. Shoprite CEO Pieter Engelbrecht, who recently took over from Whitey Basson, said in the results statement that to sustain growth, the group is ‘constantly investigating the potential of new markets, not only in Africa but also on other continents’. In the news recently was the possibility of a merger between the Shoprite Group and Steinhoff International, a South African-based international retail holding company. Negotiations, however, ended abruptly – Steinhoff said that while the proposed merger presented exciting opportunities, an agreement could not be reached regarding the share exchange. Numerous other retailers have moved into Africa over the years (some of them partnering with developers to secure quality retail space) including Massmart, Truworths, Woolworths, Pep and the Foschini Group (TFG). 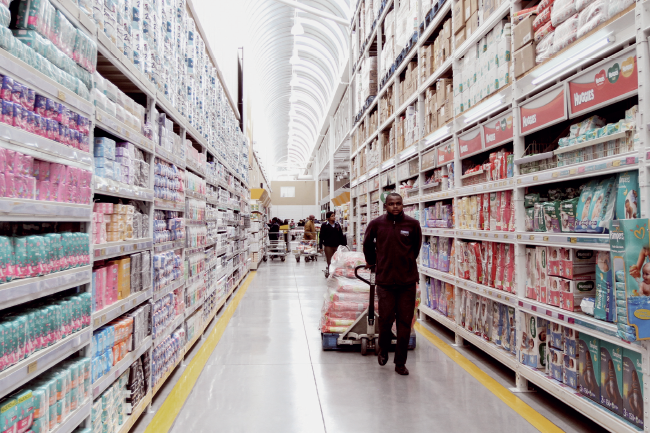 Massmart, the South African subsidiary of US retailer Walmart, is Africa’s second-largest retail group. It comprises four divisions operating in 412 stores across 13 sub-Saharan Africa countries, with 39 stores outside of South Africa (these producing 8.7% of the group’s sales). Massmart brands include Makro, DionWired, Rhino Cash & Carry, Jumbo Cash & Carry, Game and Builders Warehouse. Vallie adds that Massmart’s approach has been to take its most mature brand into Africa – namely Game. Its second growth phase was in another area where the group had already excelled in South Africa – the DIY and building materials market. ‘Builders Warehouse has proven to be incredibly successful, with city expansion into three countries – Botswana, Mozambique and Zambia – resulting in excellent sales and margin growth – ZAR1 billion out of six stores in just three years,’ she says. The third phase leverages the group’s wholesale food skills in South Africa and aims to supply the informal retail market, which Vallie says accounts for some 80% of sales in Nigeria. 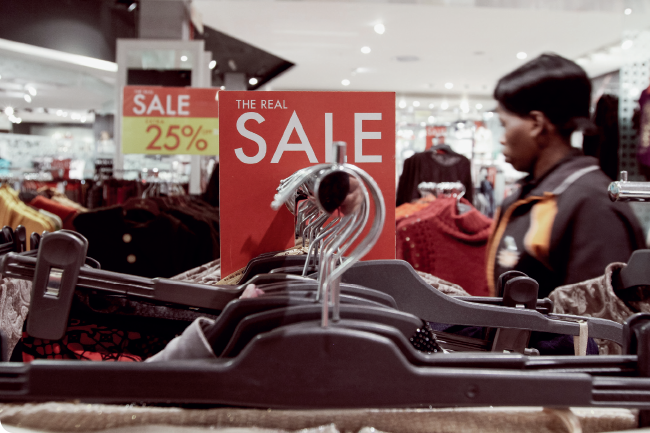 Truworths International, which has more than 723 stores in South Africa and 47 stores in eight countries across Africa, is one of the largest retailers in the continent. The company highlights an Africa strategy in its 2017 interim results report, noting that it operates large format stores in what it calls ‘A+’ positions in the centre of malls and high streets in most major shopping nodes in Southern Africa. According to the report, at end-2016 Truworths had 17 stores in Namibia, eight in Botswana, five in Swaziland, seven in Zambia, four in Ghana and two per Lesotho, Kenya and Mauritius. Previously, it also had four stores in Nigeria. However, the company exited the country in early 2016 due to stringent regulation of stock imports, high costs and scarce foreign exchange. Robert Broll, retail leasing consultant East Africa for Broll Property Group, says significant retail developments have recently been seen in Kenya, which not only has the largest retail market in sub-Saharan Africa outside of South Africa but also the highest number of shopping malls. This has brought with it retail franchises from as far afield as Europe and Dubai. Broll attributes this growth to a ‘rapidly growing and emerging middle class and available real estate – now retailers actually have decent malls where they can open shops’. Significant development is also taking place in Kampala, Uganda, and there is a lot of talk about Dar es Salaam, Tanzania, though new retail developments have yet to be announced. In September 2016, TFG opened its first Kenyan store, jewellery brand Sterns, at the Junction Mall in Nairobi and, according to reports, intends to open three more stores in Kenya this year. Manie Maritz, director at TFG, says the country is a good investment destination as its retail environment, infrastructure and growing middle class are relatively well developed compared to other countries in Africa. He adds that the group’s investments are made with a medium- to long-term view – the aim is to have 250 to 300 stores in other countries (outside of South Africa) by 2022. It’s not only Africa’s traditional retail sector that is seeing a surge of new interest – online retail (or e-tail, as it has become known) is also showing great potential. In fact, Deloitte has forecast that by 2018 the continent’s e-commerce market will be worth approximately US$50 billion. In some African countries (for instance, Cameroon and Ghana), the industry is less developed. However, South Africa and Nigeria already have several established e-commerce players. E-tailing, says PwC, holds an attractive value proposition for sub-Saharan Africa due to underdeveloped brick and mortar retail, in addition to the convenience it provides. ‘With growing internet penetration through smartphones, it’s conceivable that online retail could, to an extent, leapfrog traditional brick and mortar trade,’ says PwC. South Africa and Kenya aside – countries where many traditional retailers have launched online offerings – the industry is generally driven by pure e-commerce companies, many of which originated in Nigeria and expanded from there. These platforms include Konga, Jumia, Zando and Kaymu. Takealot, Yuppiechef and Bidorbuy are some South African examples. To encourage this growth, adds Wilken, markets need stable economic conditions, which are themselves influenced by a number of factors, including exchange rate stability, availability of power, government investment in infrastructure and policy certainty. ‘Countries need to create an environment in which developers are willing to take the risk to pursue new developments,’ he says.